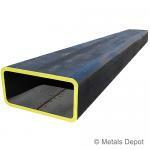 Metals Depot stocks a wide range of sizes in steel, aluminum, and stainless steel rectangle tube. Most common applications include frame work, support columns, gates and fencing, handrails, protective barriers, roll cages, truck racks, and more. Rectangle tube is available in various stock lengths and custom sizing with no minimum order required. Aluminum Rectangle Tube is frequently used when light weight and corrosion resistance are important. Aluminum rectangle tube has square corners inside and out with no weld seam. It is frequently used in frame work, support columns, gates and fencing, handrails and protective barriers. Shop for Aluminum Rectangle Tube Online! Shop for 304 Stainless Rectangle Tube Online! 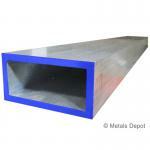 Shop for Steel Rectangle Tube A513 / A500 Online!